Having put together my thoughts for the talk in a customary PowerPoint presentation of a deck with 19 slides, it occurred to me that the storyline is not as obvious or clear by just examining the slides. There is also an overwhelming amount of data from 1960 to 2017, with projections to 2020, that make up the bulk of my talk. Thus, a globalEDGE Blog post seemed warranted! As many readers of my globalEDGE Blog posts and listeners of my globalEDGE Business Beat radio show know, I trace my background to being a native of Sweden who have lived in the United States since 1987. Being from Sweden, friends in my home town of Uppsala, Sweden have largely the same needs and wants as I do in Okemos, Michigan in the United States, and so on. A core reason for our needs and wants being very similar is the knowledge-intensive world we live in today that ensures that most people everywhere – but particularly in developed and most emerging nations – know about every product and service that is available almost all the time! With that backdrop, in a series of op-ed articles in The Hill, I have discussed global efficiency and bullwhip effects in global supply chains, and how these are affected by the increased trade barriers (e.g., tariffs) that the world is now facing. Ultimately, these dual threats to the world economy will influence customer satisfaction around the world. This blog post is a compilation of some of the key thoughts in my op-ed articles. The idea is that I want to focus on delving into what we know about today’s global investment environment and international production trends. Specifically, this allows me to elaborate on how global efficiency and supply chain issues relate to understanding today’s global investment environment and international production trends. Customer satisfaction serves as the underlying “performance” objective in my thinking (along with, of course, profitability of companies and economic robustness of countries). To start, the value of world trade has grown consistently faster than the growth rate in the world economy since 1960, and it has been much higher since the turn of the century. Since 2000, trade across country borders has been at least double the total production of all countries combined. What accounts for this trade growth is the combined trade of raw materials, work-in-process (e.g., component parts) and finished products. By 2020, we expect the value of world trade to be about 167 times larger than it was in 1960, whereas the world economy will be only 65 times larger. Given these numbers, there are several important implications related to the evolution of world trade, world production, population, and regional trade agreements. For example, what’s important to understand is that there is a correlation of 0.991 between the number of regional trade agreements that are active in the world and the cumulative value of trade across country borders. In other words, more trade agreements in force equals more trade across country borders – rather simplistic but hard to understand (perhaps) for some in today’s politicized world. One can also make an argument that as world production starts utilizing much of the globe’s resources and unemployment goes down while population increases, there will be diminishing resources for production that will be noticeable. At the same time, the globe is not as homogenous in its people, customers’ needs and wants, and global markets as some make her out to be. The 195 countries and some 61 territories on our planet still has people that like to customize their lifestyles, habits, and consumption. Such uniqueness adds to the pressure on global supply chains, global efficiency, and manufacturing productivity. Thankfully, consistently over time the world economy has become more efficient, to no one’s surprise. But, since I already brought up politics (! ), these global efficiencies are now threatened with the escalation of tariffs (and other trade barriers). Up to this point, the reason for the steady increase in global efficiency has a lot to do with the lowering or removal all-together of barriers to trade. Broadly, tariffs/barriers can raise revenues for governments and protect local production, but most of the time they also hurt worldwide production efficiencies. Using the simplest explanation, countries that are superior at manufacturing certain products or parts have increasingly done so since the 1960s, or at least significantly since the turn of the century. Basically, comparative advantage among countries has flourished globally and absolute advantage has become a nice supporting mechanism within markets. Using these advantages, several reasons exist why countries and companies realize value based on global efficiencies by engaging in multiple border crossings to make one product (e.g., automobiles). Lowering barriers to border transactions (e.g., tariffs) and specialization in production (e.g., component parts) are two of the primary macro-specific reasons. Frictionless trade, or as friction free as we can make it, and experience curve effects create uncanny performance outcomes! 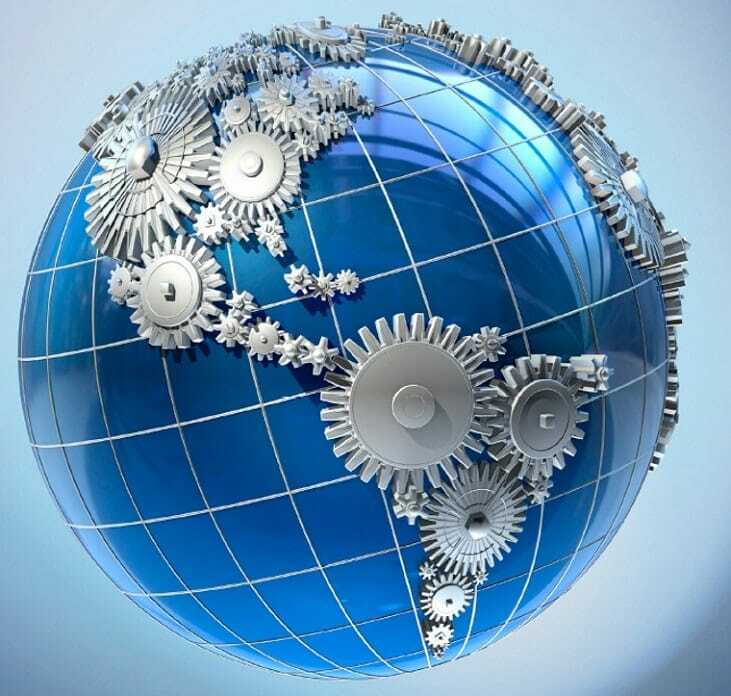 In short, we can say that the globe has become structured as a dynamic, ever-evolving and increasingly efficient complex web of supply chains that support advantage-based production globally. We have come to rely on these increased global efficiencies in production to progress toward a better world, improve standards of living, and several emerging markets advancing to become high-income nations. For decades, these global supply chains have supported a cumulative win-win for the world. Some technical data illustrate this point. From 1960 until 1972, the ratio between the value of what was traded across country borders to the cumulative production (GDP) for all countries was between 1.00 and 1.17. Basically, we traded about the same value of goods and services as what we produced. From 1973 to 1999, the trade-to-production ratio was between 1.32 and 1.92. But, from 2000 to 2017, we have hovered between annual ratios of 2.00 and 2.65. The troubling part is that for the first time in seven years, we expect this global efficiency ratio to go below 2.60 in 2018, and then become lower in 2019 and 2020 (2.57 to 2.59). What does this mean? Unfortunately, the combination of escalated trade wars using tariffs as the strategy and the dramatic growth in cross-border trade since 2000 relative to total world production spells serious problems. A small increase in tariffs in seemingly a small part of the economy – like the initial $34 billion in tariffs between China and the U.S. – ultimately has the potential for massive disruption of the global economy due to its unintended bullwhip effects in international trade. Instead, what we should keep in mind when instituting tariffs is that the larger the difference between the growth rates of world trade and world production, the greater the extent of global efficiencies that may be disrupted. So, here we are. What we do know is that the world has created global efficiencies over decades that are now being politically challenged from its half-century of global win-win evolution to a more nationalistic country-win scenario, wherein some countries win and some countries likely lose. That said, regardless of the initial win-lose negotiation tactics, perhaps the end-result can ultimately be the same if a fair trade agreement can be struck for the countries involved. Dr. Tomas Hult is professor in the Broad College of Business at Michigan State University and executive director of the Academy of International Business. In 2016, Hult was selected as the Academy of Marketing Science Distinguished Marketing Educator, as the top marketing professor worldwide for scholarly career achievements.